Quick and easy quilts can be so gratifying. We’re all so busy these days and the time we get to spend quilting has become very precious, so it’s good to able to whip something up in a few weeks rather than a few years. 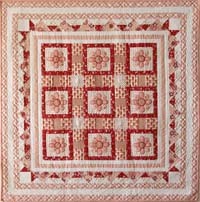 Gypsy Garden is perfect for a quilting quick-fix. 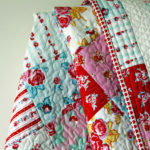 It has a gorgeous mix of large floral fabrics, stripes and geometric prints that are cut and stitched into simple blocks. These half square triangle blocks are set on point and framed with three easy borders. 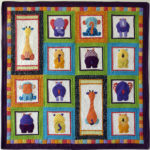 The detailed Gypsy Garden Quilt Pattern, with step-by-step instructions, is now available. Thanks to Sandra Kelly at Art N Quilting Studio for the beautiful quilting. This is really pretty. Having beautiful fabrics is key. That is so true, Melanie. What a beautiful quilt! The colors are just lovely, warm and welcoming. I can’t wait to try this pattern. Thank you for another wonderful quilt.